This is a great way to recycle the pulp from your juicer! The majority of the vitamins, anti-oxidants and minerals may well have ended up in your juice drink, but if you have a relatively inexpensive juicer like me, they are not 100% efficient at extracting all that goodness. That pulp is also a valuable source of fibre – something many of us go to lengths to increase in our diets when we have been tipping it on the compost heap! My tip on creating great pulp to use in this recipe is to be careful in your choice of juicing ingredients. I made these with the pulp from pear, carrot and courgette (zuchini) to create a pulp that still had some sweetness and flavour to it. 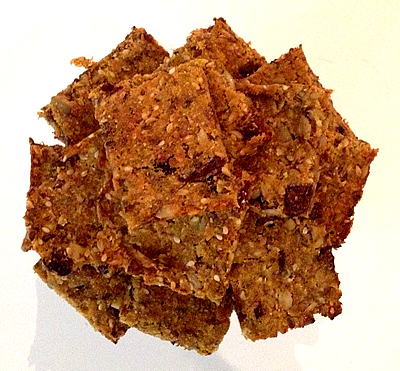 Kale probably wouldn’t make good energy bars, but can be incorporated into other pulp recipes. If you use fruit that has a core, I recommend coring before juicing to ensure you’re not eating the pips. Same goes for topping and tailing fruit and veg where necessary. Turn the mixture out onto the baking paper and spread out with the back of a spoon until it’s an even thickness (approx 1/2inch). Bake in the oven for approx 20 minutes until it begins to brown.